The review embargo for Super Mario Odyssey just lifted, and craziness has ensued. Apparently so many people are trying to read reviews (spoiler: they’re good) that Metacritic keeps on crashing. I know, because I’ve been trying to access the site since about 9AM ET, and keep getting a 503 error. 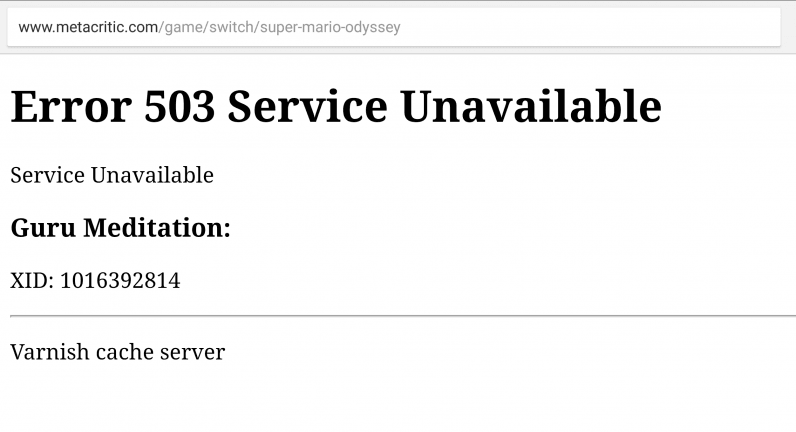 Sometimes I’m able to access the main Metacritic site, but the page for Odyssey only load occasionally. Some popular gaming sites I’ve tried to access have been intermittently crashing, too. After Nintendo achieved many perfect scores with The Legend of Zelda: Breath of the Wild earlier this year – sitting at a cool 97 on Metacritic, one of the highest aggregate scores ever – everyone was excited to see whether Nintendo could possibly have two such successes in a year. Well, the reviews are still pouring in, but let’s just say my hat is off to you, Nintendo.